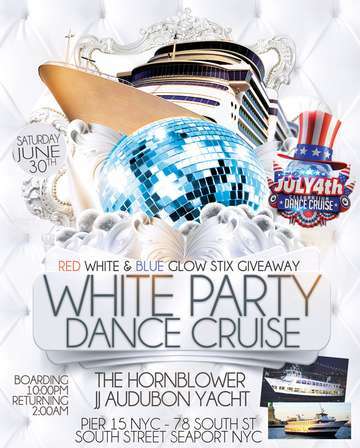 Start off your Pre fourth of July celebration on the water aboard the Hornblower Yacht New York White Party Cruise while celebrating on the Hudson River. Docking from Pier 15 NYC, South Street Seaport, take in the world-famous New York City skyline, with view Brooklyn Bridge, Ellis Island and the Statue of Liberty while you celebrate and dance the night aboard the JJ Audubon Yacht NYC. Get on your dancing shoes and enjoy drinks and dinner buffet available for purchase while the live DJs spins a mix of Top 40, house, rock, hip-hop, Latin and mainstream music. The Dance Party On The Water with 3 levels to Party ! - Smoking Allow on the Outdoor Decks. Please Note The Hornblower Yachts NYC Rules and Dress code !! All guests must be 21 & over with Proper ID required. Dress to impress, dress code is at Security’s Discretion. We sail RAIN or SHINE. The Hornblower JJ Audubon boat is enclosed and climate controlled. You are responsible for following dress code, being on time for boarding, & ID policies - or entry may be denied. No refunds or returns. Due to high demand, party cruise tickets are subject to price increases.